This album is a soulful and lyrical experience that's is a testimony to a very organic style of music. 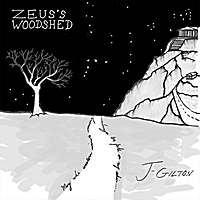 Zeus's Woodshed was left mostly unoccupied since the fall of the Roman empire. It resides on the foothills next to mount Olympus were it was rediscovered one day when I decided to take a hike up the mountain with only a backpack and my guitar, Old Red. As I approached one of the crests of this old misty mountain I saw at the very top, through the fog, a gleaming white marble building resembling the Parthenon. It was looming in stature and was surrounded by clouds as lightning danced across the sky. As I stood in awe I felt a rain drop on my shoulder. I looked up and the clouds were growing darker and more menacing. I then saw to my right, a small wooded shack. I went to it to seek shelter from the coming storm. The old thick wood door creaked open very slowly. I looked in and saw old lightning bolts hung on the walls. They were covered in dust but still managed to give off enough glow to light the old wood shed. With nothing but time to kill, I pulled out Old Red and began to play..
LOVE IT!!! This album is a great example of what someone can do if they put their mind to it. If only we had more J Gilton's in the world!